The three-door Up Lite has a two-cylinder diesel engine, a 10-kilowatt electric motor and a carbon-fiber roof. 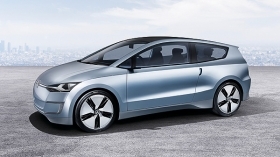 LOS ANGELES -- Volkswagen of America will introduce an electric version of its upcoming Up hatchback in 2014 in the United States. In a world debut, VW unveiled a four-seat concept version, called the Up Lite, at the Los Angeles auto show. The three-door car has an 800cc, two-cylinder diesel engine, a 10-kilowatt electric motor and a carbon-fiber roof. The Germany-built car will sell in Europe initially, said Ulrich Hackenberg, head of technical development for Volkswagen AG. The concept has fuel consumption of 2.44 liters per 100km (70 U.S. mpg). Its CO2 emissions are 65 grams per kilometer. The standard Up hatchback, which will not sell in the United States, will go on sale in Europe at the end of 2011. The Up line also includes a minivan and a sedan. Also at the auto show, VW of America President Stefan Jacoby said a new-generation Beetle that will be sold in the United States as a 2012 model will contain a clean-diesel engine. Jacoby said the Volkswagen brand continues to add diesel engine options in the United States. A new mid-sized sedan that will be built in Chattanooga, Tennessee, in 2011 will also contain a clean-diesel engine.